Olivia was in love with the new Princess and the Frog movie, and she asked me to plan a Princess and the Frog party for her third birthday. As we were inviting close family and friends there were only a couple of children attending, so I wanted to make sure everyone was comfortable and happy. 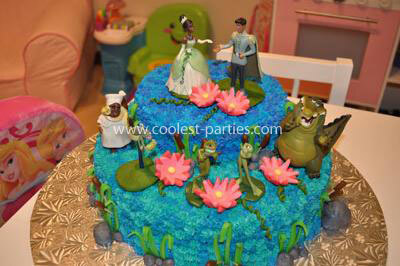 I settled on a Mardi Gras themed party to complement the Princess and the Frog themed activities for the kids. I handmade the invitations (I am an avid scrapbooker), in mardi gras yellow, purple and green. First, the FOOD. Of course, if you know Princess and the Frog, you know it is set in New Orleans. So, we had to make muffalettas (which are enormous, loaf sized cold cut sandwiches). To keep the kids happy, we made various tiny poboys out of miniature buns. I made a ton of deep fried Cajun shrimp as finger food, and tiny deconstructed gumbo skewers. To make those, I simmered all of the fixings for gumbo (sausage, peppers, chicken) and then threaded the pieces on to skewers for gumbo-on-the-go! The finale was homemade beignets, which are huge deep fried donuts. These were real winners! I had spent the afternoon proofing the dough and shaping the beignets into squares, before deep frying them to order and covering them in liberal shakes of icing sugar. They were spectacular! To drink, we served iced tea and hurricanes for the adults, and mixed fruit juice for the children. Finally, the CAKE. My absolute favourite part! I was inspired by the Princess and the Frog figurines, which I bought at a local Disney Store. I thought they looked absolutely lovely. I am just starting out with cake decorating, and was totally scared of fondant, so I was thrilled to be able to buy the characters instead. I also was inspired by some very professional cakes that I saw on the internet. The cake itself is a plain chocolate box cake, made with two different sizes of tin. I did a practice cake first to ensue that one wouldn?t collapse on to the other! I then covered the two stacked cakes in a zillion tiny iced stars, using an icing recipe from Wilton which is my go-to. I coloured the icing in four different shades of blue to blue-green, which added to the whimsical feel of the cake. My favorite part was making the rocks, bulrushes, lily flowers, pads and tendrils out of fondant. The rocks were relatively easy, coloured with black Wilton gel and covered in tiny holes made by a toothpick. The bulrushes were coloured with brown Wilton gel colour and stuck on the top of toothpicks. The lilypads were the hardest part of get right. I used them to anchor the more unstable characters, which was a great practical and pretty solution to an otherwise tricky problem. I loved the lily flowers, even though my original plan of a buttercream icing flower was a total failure! Instead, the fondant versions held their shape and looked great. 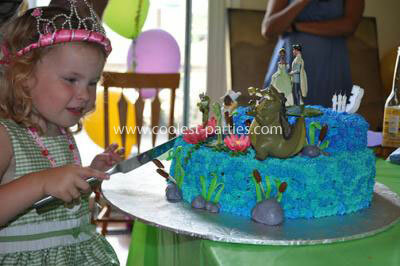 The tendrils were made with green coloured fondant, wrapped around skewers until firm, then slid off and placed. The only shame of the whole thing is that my daughter only got to see the cake for about 15 seconds before she wanted a piece!! She was absolutely thrilled, and the look on her face was completely precious. The GAMES. 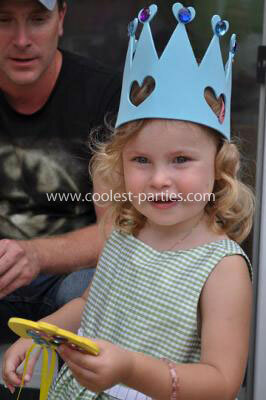 To keep the kids busy, we had them decorate their own foam crowns and scepters with jewels and stickers. This meant that I didn?t have to do a loot bag as there was plenty to take home with them when the party was over. We also did a pull string piñata, and handed out fistfuls of mardi gras beads. The MUSIC. Because the party involved so many adults, I wanted to keep the youthful party spirit without the strictly kid-oriented music. I downloaded the Princess and the Frog instrumental soundtrack, which leant a lot to the ambiance. I also purchased a Preservation Hall of New Orleans CD, which really created a great party spirit. In all, a fabulous time was had by all, adult and child alike. It IS possible to do a kids party that is fun for everyone, regardless of age (and I still get asked to do the beignets again every few weeks!). NICE! 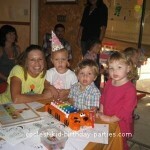 last year for Roslyn’s birthday #2 it was back home with Family as was great. This year she wants Princess and the Frog as well. 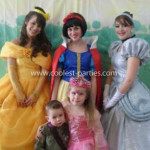 You have not only given us some great guidance, but also that long sought after notion that it can be fun for all (the last dozen parties we have been too, have been solely focused on the kids, and for the group of adults that mostly don’t know each other it was 2 hours of standing around looking stupid). Ros even asked if I’d be the shadow man (she found my velvet blue jacket and top hat from Halloween past). Not sure how I will work that in but… Keep having fun and thanks again!